The fruit is said to be nervine, cephalic, and emmenagogue. It is prescribed in the form of powder, an electuary, and a decoction. A decoction of the dried fruits is given in the treatment of common cold, headache, watery eyes and mastitis. The fruit contains an acid alkaloid, and colouring matter. The inner bark is chewed and swallowed as a remedy for dysentery. 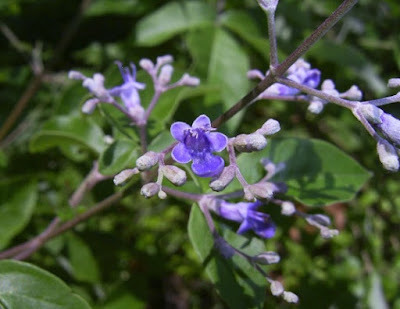 The plant is often used as a hedge, especially in Asia, although it may trigger various allergic reactions (sneezing, respiratory problems, dizziness, headache, nausea) to people trimming or pruning such hedges. The plant has been used to control erosion on sand dunes, which it does well within its native range. However, its ability to escape from cultivation, plus its negative effect upon some wildlife, makes it unsuitable for this purpose in other areas. The plant makes an excellent ground cover. 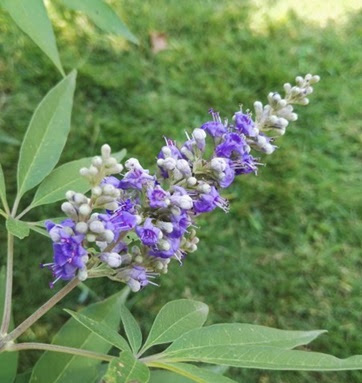 The leaves contain 0.11 - 0.28% of an essential oil and a resin. The chief constituents of the oil are l-d pinene and camphene, which between them constitute 55% of the oil, there is also 10% terpinyl acetate and 20% of a diterpene alcohol. The flowers and seeds of the plant are used in the making of leis. The leaves are burned as an insect/mosquito repellent. Oils from the leaves show considerable mosquito repellent activity. The active principle has been identified as rotundinal, a cycloterpene aldehyde. The plant shows considerable potential as a botanical pesticide that may be applied both indoors and outdoors. The wood is used in light construction and for tools and axe handles. Most experts suggest a dose of 1-4 grams daily of ginger powder, tablets, or fresh-cut ginger in divided doses by mouth. Many publications note that the maximum recommended daily dose of ginger is 4 grams. For an anti-inflammatory use, 2 grams of ginger root extract has been taken daily for 28 days by mouth as eight 250 milligram capsules (Pure Encapsulations®). 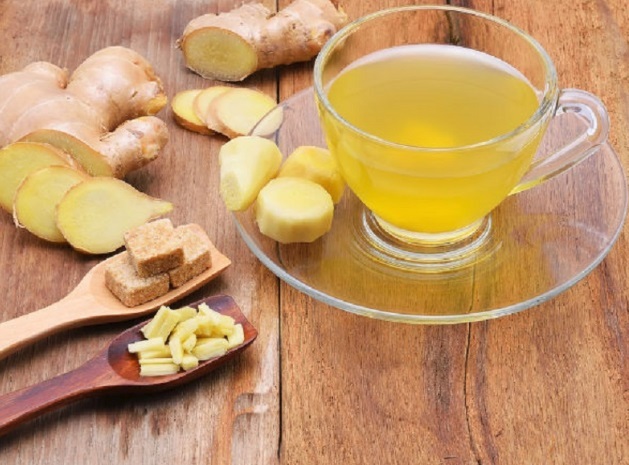 For chemotherapy-induced nausea and vomiting, liquid ginger root extract has been taken in doses of 0.5 grams, 1 gram, and 1.5 grams in divided doses by mouth twice daily for six days. Ginger root powder capsules have also been taken in doses of 1 gram or 2 grams by mouth daily over the first three days of chemotherapy. For exercise recovery, six capsules totaling 2 grams of raw or 2 grams of heat-treated ginger have been taken by mouth daily for 11 days. For gastrointestinal motility, 1 gram of ginger powder diluted in 100 milliliters of distilled water has been taken by mouth. For high cholesterol, 3 grams of ginger capsules has been taken daily by mouth in three divided doses for 45 days. For indigestion, 1.2 grams of ginger root powder has been taken by mouth as a single dose. For irregular heart beat from high blood sugar, 1 gram of ginger root has been taken by mouth before undergoing fasting electrogastrography. For motion sickness or seasickness, 1-2 grams of ginger has been taken daily by mouth in divided doses. For nausea and vomiting after surgery, 0.5-1 grams of ginger has been taken one hour prior to surgery. Two to three capsules of ginger (each containing 0.5 grams of ginger powder) have been taken by mouth one hour before a gynecological laparoscopy. Ginger use during surgery should be approached cautiously. For nausea and vomiting during pregnancy, 500-2000 milligrams of ginger extract (EX.EXT 35) or powder has been taken by mouth for up to three weeks in capsule or syrup form in single or divided doses. Consumption of ginger in amounts greater than those commonly found in food (<1 gram of dry weight daily) is not suggested during pregnancy by some authors. For osteoarthritis, 30-1,000 milligrams of ginger has been taken daily by mouth for periods of 3-12 weeks in single or divided doses. Specifically, a combination formulation of two ginger species, Zingiber officinale and Alpinia galanga (EV.EXT 77), has been taken by mouth twice daily for six weeks. For painful menstruation, one capsule containing 250 milligrams of ginger root powder has been taken by mouth four times daily for three days from the start of the menstrual period. For pain relief, 30-2000 milligrams of ginger, ginger extract, or ginger root powder has been taken by mouth in single or divided doses for exercise-induced muscle pain, osteoarthritis pain, pain during menstruation, or gonarthritis pain. For respiratory distress, 120 milligrams of ginger extract has been taken in three divided doses for 21 days through a feeding tube inserted in the nose. For rheumatoid arthritis, 1-4 grams of powdered ginger or ginger has been taken by mouth daily. For weight loss, 2 grams of dried ginger powder dissolved in 6 ounces of hot water has been taken by mouth as a single dose. Note: The mild gastrointestinal distress sometimes associated with ginger may be reduced by taking ginger as a capsule, rather than powdered ginger. There is no proven safe or effective dose for ginger in children.